From Northridge to North Hollywood to Woodlands Hills to Studio City – the San Fernando Valley covers miles and miles of metropolitan activity. Much of this activity involves the flow of vehicles and pedestrians heading to hundreds of destinations. So how does the big Valley prevent this traffic flow from bogging down in the face of construction projects or special events? How is control maintained? Only a highly-qualified resource could tackle the challenges of traffic control in San Fernando Valley. That resource is Roadway Construction Service. A major ingredient of successful road traffic control is experience. Fortunately, Roadway Construction Service has the years the spare. We’ve been maintaining order for a long, long time. Consequently, we know what to expect and how to deal with it. Surprises seldom surprise us. San Fernando Valley construction zones certainly grab much of our attention. But we can handle other situations quite nicely. Like those densely-packed holiday parades. If pedestrians and vehicles are in motion, we’ll make sure they stay that way. How do we meet the slew of traffic control challenges? Well, you might say we have many tricks up our sleeves. One of them is something we conjure up quite frequently – the barricade. No doubt, you’ve seen a few, mainly because they’re virtually impossible to miss. Which is exactly the way we plan it. Whether the traffic barrier is a massive Jersey Barricade or a compact, bright-glow orange cone, visibility is one of their best features. Human beings also contribute to effective road traffic control. Headlining the list of on-site humans is our squad of traffic control flaggers. These experts speak volumes — but not with their mouths. Their preferred mode of communication is crisp waves of big, bright flags. These flag signals are the ultimate form of instant messaging, conveying crucial, on-the-spot information to other crew members regarding traffic conditions and movement. How did our traffic control flaggers get so good? Training — hours and hours of rigorous, nose-to-the-grindstone training. They emerge from the experience with the highest credentials, including the highly-regarded OSHA certification. 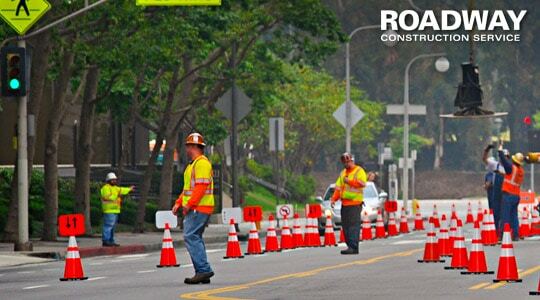 Another important facet of our traffic control services in San Fernando Valley is traffic control planning. This happens long before the first cone is deployed or the first signal flag waved. Making it happen is our team of traffic control planners, who are entrusted with crafting air-tight strategies that maintain order and safety on the streets. During this stage, these dedicated traffic control engineers must consider many variables, including weather, traffic density, pedestrians, and possible hazards. An adjunct to traffic control planning is traffic control permitting. To obtain the all-important permits, plans must meet the requirements of government officials and other key decision makers. We’re pleased to say that turn-downs are a rarity in our neck of the woods. Would you like to learn more about premier traffic control in San Fernando Valley? Reach out to Roadway Construction Service any time. We’ll be happy to provide additional information and answers to all your questions.